Borrusia Dortmund moved 9 points clear at the top of the German Bundesliga this past weekend. Lucien Fevre’s charges defeated Werder Bremen 2-1, just hours after second placed Borrusia Monchengladbach had drawn 0-0 away to Hoffenheim. The game at Signal Iduna Park saw Paco Alcacer open the scoring on 19 minutes with his 11th of the season. Eight minutes later, Captain Marco Reus doubled Dortmund’s tally. However, 10 minutes to the break Max Kruse pulled one back for Bremen. Despite both side getting chances in the second half, neither could add onto their first half tally as Dortmund went on to register their 12th victory of the season and move onto 39 points atop the standings. For Bayern, they made it three wins on the trot thanks to a 4-0 victory away to Hannover 96. Intelligent right-back Joshua Kimmich opened the scoring inside two minutes before David Alaba increased the lead on 29 minutes. In the second half, Serge Gnabry and Robert Lewandowski added a goal each to ensure Nico Kovac’s side move level on points (30) with Monchengladbach who are in second. In Leipzig, home side RB returned to winning ways with a 4-1 win against Mainz. A brace each by Yousef Poulsen and Timo Werner either side of a Karim Onisiwo consolation did the damage for last season’s surprise package. The victory on Sunday saw Ralf Rangnick’s side maintain 4th place, two points ahead of Frankfurt who scrapped to a 2-1 victory over Bayer Leverkusen. Elsewhere, there were victories for Wolfsburg, Stuttgart and Fortuna Dusseldorf in their respective fixtures. Wolsburg ran out 2-0 winners at Nurnberg, Stuttgart defeated Hertha Berlin 2-1 while Dusseldorf overcame Freiburg 2-0 thanks to a Kaan Ayhan double. 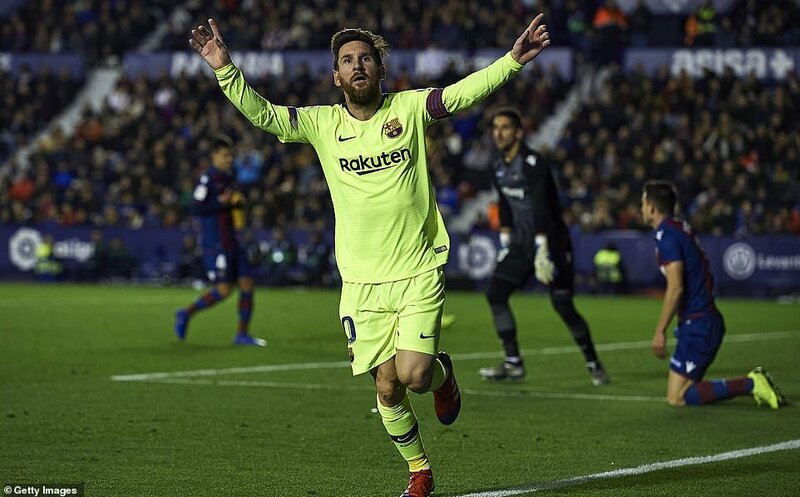 In Spain, Lionel Messi continued his remarkable scoring form with a hat trick in Bercelona’s 5-0 victory over Levante on Sunday. The Argentine who has scored over 600 career goals took his season’s tally to 20 with 14 of them coming in La Liga. Luis Suarez and Gerrard Pique were also on the score sheet in the win that maintains Barca’s 3 point caution on top of the standings. Second placed Sevilla also continued their impressive start to the campaign, winning 2-0 at home to Girona. After a 0-0 draw in the first half, Ever Banega and Pablo Sarabia scored inside the first 19 minutes of the second, to propel Sevilla onto a 9th victory of the season. For third placed Atletico Madrid, they played out a 5 goal thriller away to Real Valladolid and through an Antoine Griezmann barce and Nikola Kalinic opener, ran out on top of the contest. The home side who at one point trailed by two, scored through Fernando Calero and a Saul Niguez own-goal. In Madrid, Karim Benzema scored the only goal of the game as Real defeated Rayo Vallecano 1-0 on Saturday. The victory is Madrid’s 9th for the season and Santiago Solari’s side remain in 4th, five points behind leaders-Barcelona. Elsewhere, Real Betis and Getafe continued their march up the table with victories over Espanyol and Real Sociedad respectively. Betis overcame Espanyol 3-1 away from home while Jorge Molina’s 3rd minute strike was all that did damage for Getafe in the 1-0 win over Sociedad at the Coliseum Alfonso Perez on Saturday. Ironically, none of the bottom 14 sides registered a victory this past weekend. In Italy, both Juventus and Napoli returned to winning ways in their respective Serie A fixtures. With both sides losing in the UEFA Champions League days earlier, the two had potential Banana skins to negotiate with Juventus away to Torino in the Turin Derby while Napoli headed east to face Cagliari. They however both triumphed 1-0 with second half goals as Cristaino Ronaldo scored from the spot in Turin while Arkadiusz Milik struck in the 90th minute for Napoli. After two games minus victory, Inter Milan put their Champions League elimination out of the window and resumed normal duty in the Serie A, defeating stubborn Udinese 1-0 on Saturday afternoon. Mauro Icardi struck the only goal of the game from the spot on 76 minutes to tighten Luciano Spalleti’s sides’ grip on 3rd spot. With Roma and Milan not in action over the Weekend, the quadruple of Roma, Sassoulo, Sampdoria and Fiorentina edged closer to European football with victories in their respective fixtures. Roma came from behind to defeat Genoa 3-2 at the Olimpico with Bryan Christante scoring the winner at the hour mark. Sassoulo defeated Frosinone 2-0 away from home, Sampdoria required two second half goals in three minutes to dispatch a resilient Parma side 2-0 in Genoa while Firoentina undid Empoli 3-1 in Florence. None of the sides in the bottom half triumphed on the weekend. In France, with several games postponed over the weekend due to ongoing demonstrations and riots, only four Ligue One games where played. Moussa Doumbia and Mathieu Cafaro struck either side of an Adrien Thomasson consolation as Reims defeated Strasbourg on Saturday. In Sunday’s games, 10 man Lille powered their way past Nimes 3-2 at the Stade des Costières. After Jose Fonte was sent off on 16 minutes, Christophe Galtier’s side raced into a 3-0 lead with goals from Rafael Leao, Jonathan Bamba and Nicholas Pepe. 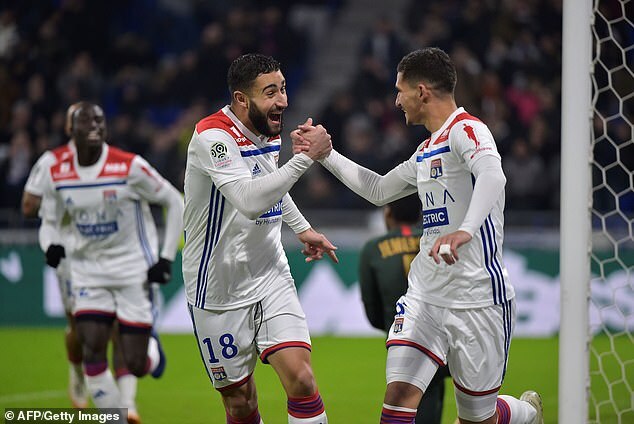 Despite the home side scoring twice through Rachid Alioui and Clement Depres, Lille held on to register their 10th victory of the season and subsequently reduce PSG’s lead to 10 points (PSG now have two games in hand). At the Allianz Riviera, Nice and St. Ettiene played out to a 1-1 draw with both sides having a man sent off. Lois Diony put the visitors ahead on 53 minutes before his colleague Yannis Salibur was given his marching order for a second booking 9 minutes later. For Patrick Viera’s side who saw Christophe Gerelle sent off on 58 minutes, equalized via a Wylan Cyprien penalty 9 minutes from time. In the last fixture of the day, Lyon cruised past Theirry Henry’s Monaco 3-0. Houssem Auaor, Nabil Fekier and Ferland Mendy were all on target for the home side who now climb into third, two points ahead of Merseille.